Andres Iniesta has reached a decision on his Barcelona future ahead of the expiration of his contract this summer. The Nou Camp icon has been linked with a move to the Chinese Super League during the close season, while a new deal with the La Liga leaders has also been touted as a possibility. But speaking after Barcelona’s 2-1 victory over Valencia on Saturday, Iniesta revealed that he already knows his next step. ‘I’ve already decided what I’m going to do,’ he told reporters. ‘I’ve always had affection from the fans. I’m grateful to those who have been there for more than 20 years. Their support has been essential for winning. 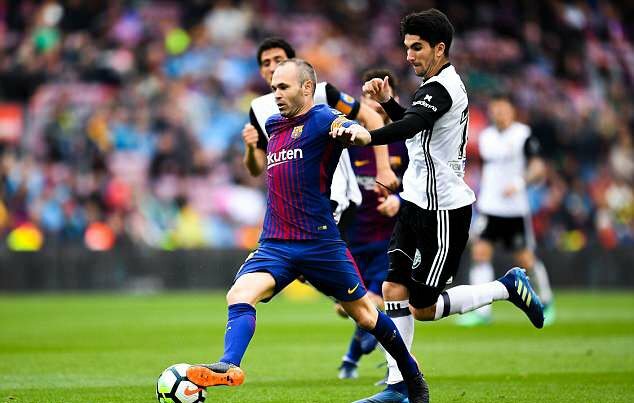 33-year-old Iniesta has enjoyed a glittering career at Barcelona since breaking through from the club’s famous La Masia academy in the 2002-03 season. He has won the Champions League four times and helped Barca to eight La Liga titles during his 15-year spell to date. The midfielder featured prominently on Saturday as Ernesto Valverde’s men beat Valencia 2-1 at home to set a new Spanish league record of 39 games unbeaten. In doing so, the Catalans surpassed Real Sociedad’s long-standing total of 38 across the 1978-79 and 1979-80 seasons. Barcelona are 11 points ahead in the table with six games to play, and remain on course to retain the title from staunch rivals Real Madrid.